I’ve had a chip in my windshield (windscreen?) for month or so now. Every time I see it, it niggles me. I really need to do something about that. In a very stupid way, it was chipping away at my self-esteem every time I saw it. It was my car telling me that I’m too incompetent, too lazy to get around to fixing a stupid chip in a stupid screen, which could be a REALLY BIG DEAL if and when the windshield broke because I hadn’t got it fixed. It’s nuts. Brain’s are stupid that way. Today, I finally got to that point, and in a five minute phone call arranged for my insurance to get it fixed for free tomorrow in my driveway! Daughter #2 never puts her laundry away. She’s allergic to it, I think. As a last resort, I put her on a timer last week. It took her 3 minutes…well, 6 minutes to get it into her room and in the drawers. 6 stupid minutes. Staring at that %@#%ing pile of laundry had been eating away at me for weeks. The thing is that this kind of thing happens all the damn time, but a slight shift in perspective can really help move things along. There’s a really annoying story about starfish stranded on a sea-shore. You know the one. I don’t think in those terms, but doing something, anything, begins to move things in the right direction. I pick up a couple of dust-bunnies from the floor. It’s nothing, but you know, there are now two fewer dust-bunnies. I put away the dishes. It’s nothing. It takes two, maybe three minutes, and makes hardly a lick of difference, but now I can actually do the dirty dishes and fill the dishwasher. These things seem like they count for nothing, but they actually move things forward, even if it’s only an inch at a time. It’s still an inch in the right direction and pretty soon you realize that you’ve cleared space both mentally and physically. I’m not so damn special that it has to be right, and I have to look perfect. I should forgive myself and be willing to get it wrong, to screw up, to apologize, to fix, to move forward. The thing done is better than the thing not done. The email sent. The phone call made. I’m not going to do the exact exercise that I should, but any exercise is better than no exercise. I’m not going to eat in the healthiest way possible, but I’ll add something to the mix, and that’s better than not. 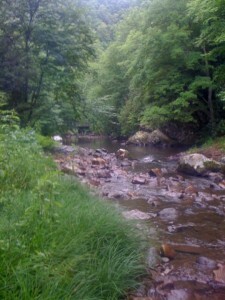 My kids and I did the Virginia Creeper Trail last weekend. It was absolutely fantastic. I cannot say enough how much fun and how gorgeous it was. This is despite the fact that we were completely drenched in a downpour. I called and made a reservation for bikes and a shuttle the day before. We drove to Damascus, VA (a little over 2 hours from Blacksburg), getting to the bike shop about 30 minutes before the shuttle left. 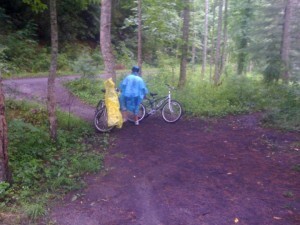 This gave us time to get the bikes, buy rain ponchos, go to the bathroom and get our act together. We could have brought our own bikes and just paid for the shuttle. You can also drop off your own bikes at the top and just one of you get a ride up while the others wait. Last, but not least, you can ride up the trail if you wish. It’s a very, very gentle slope, but it’s 15-17 miles to the top, so I imagine you’d have to be in pretty good shape. Another option is to start and finish in Abingdon, which is 34 miles from Whitetop. I didn’t realize until we got there, by the way, that there are a number of bike shops in Damascus. This is a good business for the town obviously. We rented at JC’s Outdoors and were happy with it, but the others looked fine too. Anyway, we all piled into the shuttle -about 12 people in all, with a trailer behind with the bikes on it-and were driven to the top of the trail. The ride up is on a very, very winding road and takes 20-30 minutes as I recall. Both kids were a bit queasy by the time we got there. When we rode, the stretch from Whitetop to Green Cove was closed for repairs (funded by the ARRA by the way), so we started at Green Cove, meaning that the ride was 15 miles. It took 2 1/2 to 3 hours and to be honest we didn’t stop much. The ride really was all downhill, but that’s not to say that it didn’t require any work. The slope is so gentle that you do have to pedal to keep going (the kids probably a bit more because they’re lighter, have less momentum and are on smaller bikes), and by the time we reached the end our hands were a little tired from braking and controlling the bikes. I saw a young (6-ish?) boy on the trail on a very small bike, and I would imagine that he would have been wiped out by the end (although the rain probably didn’t help). My daughters are 11 and 13 and were generally fine. The default thing to do though is just gently pedal and freewheel down the trail. Check out the Youtube videos for a sense of what it’s like. Near the top especially, the trail is a little bit muddier and rockier. At the bottom, it was more tarmac as I recall (I preferred the top). Either way, do not wear clothes that you are fond of! You will get coal(?) dirt all over your clothes, especially if it rains. It’s probably a good idea to have a change of clothes waiting for you in your car at the bottom. Most of the way the trail runs next to the river and you can stop and pull over in all kinds of places to relax, snack or just enjoy the water. There are numerous bridges that you cross. It’s just incredibly beautiful. There are places to camp if that’s your thing. About half-way down there are a couple of cafes/shops. We stopped at the first one we came to, which was more of small hut, although to be honest the one after that (across a small road bridge) looked like it had more going for it. It started raining torrentially very soon into the ride when we did it, but the kids were great. They were having a lot of fun and continued to do so, despite being pretty soaked and filthy from the mud flung up by the bikes. They both had a real sense of accomplishment when we got to the bottom and my eldest wanted to turn around and do it again. I’m really proud of their attitude about the whole day. I’m looking forward to going back. In the late 70’s, I bought a Mamod SA1 Cream Steam Roadster. I had saved up for it for a long time, and as I recall it cost me about 35 pounds, which was a lot of pocket money. Like many toys, I used it a few times, and then primarily kept it in its box and on a shelf. I have been carrying it around with me ever since. I moved recently and my daughters noticed it and prompted me to get it out. With some caution and lots of caveats to my girls about it being unlikely to work after 25 years or so in a box, we oiled the bearings, filled the boiler with hot water and took out the fuel tablets. To my frank astonishment, they lit, we placed the heat under the boiler and the engine worked beautifully. The steam engine is a marvel both of simplicity, but also of quality engineering. It was fun for my girls to steer it up and down the sidewalk, and I just love the elegance of the design, and watching the piston do its work. I think my brother had a Traction Engine. Maybe he’ll dig that out. It reminds me of a visit to the British Engineerium, and the massive pump engine there, which I was lucky enough to see in operation. It looks like the museum has had some shaky times, but I hope it sticks around. My kids’ elementary school has the principal blogging using blogger, and the school calendar maintained using Google Calendar. This makes it really easy to keep track of what’s going on at their school, using my customized Google Homepage. I’ve added the RSS feed for the principal’s blog to my home page, and the school events to the calendar widget. A bit of digging reveals that Google Calendar also supports RSS, so I could be reading both in any RSS reader. Now, if only the teacher blogs (yes, there are those) had RSS feeds too, but they use Think.com sites instead. It’s gratifying as, dare I say it, a pioneer in this stuff to see it becoming mainstream…eight years or so after it all got going! During my citizenship ceremony, the federal court judge made some remarks and used what I thought was an unusual phrase – “disciplined liberty” – it sounded wrong to me, but maybe I’m just ignorant of its roots. Posted on September 13, 2006 Categories Family, VirginiaLeave a comment on “Disciplined Liberty”? I became a U.S. citizen last Friday and only had to wait 4 days before meeting a president. Is this a standard thing for citizens? Maybe there’s some secret code or marker on me now and I’ll run into presidents all the time? Who knew? I don’t recall ever meeting the queen, although I have vague memories of getting a peek at her one time in Chichester. I do like being in a republic, even if it doesn’t always feel like one. With that said, I am proud of my English background and in some respects this was a very practical decision in terms of what was best for me and my kids (who were born here). Anyway it takes some pressure off, is one less thing to worry about and I probably don’t have to worry about being deported for a misdemeanor, although I have never committed one, thank goodness. My paperwork only took two and half years(!) although casual conversation at the ceremony with other applicants seemed to indicate that the process may now only be taking months. Anyway, I have now renounced and abjured absolutely and entirely all allegiance and fidelity to any foreign prince, potentate, state, or sovereignty (pdf). I have done the deed. Did I tell you they spelled my name wrong? I had never watched the show until tonight, but because my daughter made an appearance on it, I watched. Extreme Makeover: Home Edition this evening. My girl was one of the dancers who danced on the canvas to make the sunflower picture.